Club Carlson has launched a new promotion for staying three nights and getting a free night between January 6 and April 13, 2014. This is not really a free night, but rather 38,000 bonus points that is enough for a free night at category 1-4 Club Carlson properties. 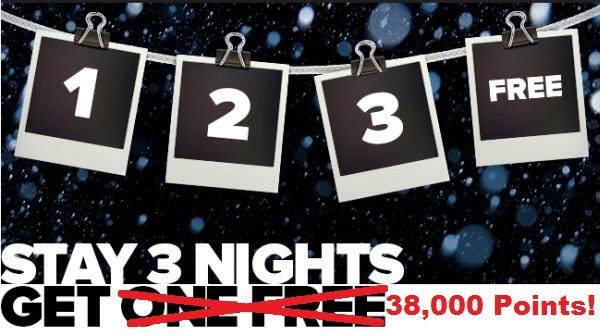 Note that this promotion is based on nights, so it is enough to have a one stay of three nights and get the 38,000 bonus points. Points + Cash stays are not eligible for this offer that you can only earn one time. You need to register for this promotion before checking out on your first stay to be eligible. You can register and access Club Carlson’s web page for this offer here. This is a very good offer considering the promotional offers from other hotel loyalty programs. This is even better for those that have the Club Carlson affiliated credit card in the US that can stretch the “free” night to two nights. Not sure why Club Carlson prefers to promote this as a free night offer? For me, it is far better to earn 38,000 bonus points that you can use the way you want rather than having free night certificate that has expiry date sitting on my account. You must be a Club Carlson member to participate in the “Stay 3 Nights Get 1 Free” promotion (“Promotion”). To be eligible to earn 38,000 bonus Gold Points (“Bonus Points”), members must register online for the Promotion at clubcarlson.com/stay3, provide their Club Carlson number at the time of reservation or at check-in, and pay for a stay on a Gold Point eligible rate at participating Radisson Blu®, Radisson®, Park Plaza®, Park Inn® by Radisson and Country Inns & Suites By Carlson℠ hotels worldwide beginning on or after January 6, 2014, and completed by April 13, 2014 (“Eligible Stays”). Members will earn 38,000 Bonus Points if they complete at least three eligible nights during one or more stays. Only one bonus per member will be awarded. Stays or nights paid for using Points + Cash are not eligible for this Promotion. Members only need to register once, but registration must be received before checkout of the first Eligible Stay to qualify.